Class was absolutely packed, with a tough warm-up from Simon. There were also three women present, which was good to see. The two new joiners haven’t bought a gi yet, but I presume they plan to stay, as they’ve been to most of the classes I’ve attended so far. Technique tonight was the guillotine, which while basic is nevertheless a fundamental move I certainly haven’t got down yet. The scenario presented was that you’ve got head control and they posture up. You follow them and go for a sit-up sweep, which they attempt to counter by pulling your arm and driving their weight forward. In response, immediately scoot your hips back and bring one arm under their neck, reaching to clasp your other hand. Twist to side on which you’ve trapped their head, then I think move slightly up (though I keep getting that wrong: either way, you need to get the bone of your forearm pressed against their neck). If they bring their legs up to resist, shrimp to the opposite side you’ve trapped their head. At the same time, use your legs to chop low on one side and high on the other: in other words, comparable to a flower sweep, taking them over diagonally. Continue holding the guillotine, which will mean they either tap as you roll them over, or if not, you’ll still end up in mount. Ricardo mentioned that in gi competition, you’d have to release the sub at that point (presumably because its potentially a neck crank, but I’m guessing there). As the class was so huge, free sparring was split into two groups, with one sitting on the side. Rounds were only two minutes, so got through lots of sparring partners. However, that short space of time also meant that they generally followed the same pattern: I’d pull guard from the knees, but so badly that I’d instantly get passed to side control. From there, I tried to stay on my side, but not all that successfully. My partner would then either transition to knee on belly, where I’d keep trying to shrimp away, or move to scarf hold. I need to review scarf hold escapes, as I’m definitely out of practice. I was also trying keep my arms tight to my neck to defend against chokes, and my head close to the floor to avoid the cross face. Along with scarf hold, my north-south escape needs work too: I can’t remember the last time I was held in north-south, as people don’t seem to bother all that often. I aimed to wriggle out with the intention of then seeing if I could swing up onto their back, but didn’t get that far. Instead, managed to follow their legs and recover half-guard, as I think they were trying to move round for a choke or something at the same time. The only spar that broke that pattern was with Lindsey, where I had another chance to keep working the triangle. As before, I need to deal with the arms, getting one in and one out in order to initiate the triangle. I was looking for an underhook too, but struggled to open up her arms sufficiently. Using my hips more might help, perhaps bridging up to make some space. My left arm was still a bit sore from the previous week, so it will be good to give it a rest until next Tuesday. I’m also hoping to get that friend along to class I mentioned a while back, depending on if he’s busy or not. He’s in Oxshott, so getting a lift sounds handy too, as that saves me the cycle ride. Unfortunately, my arm did indeed seize up the next morning after my last class. I think it was something muscular, as when I tried to raise my elbow I got a sharp stabbing pain along the outside of my upper arm. Training when feeling slightly under the weather is one thing, but there is no way I’m going to risk training with an injury. Finally made it back to an advanced class tonight, and was also hoping to double up, something I haven’t done since October. Still not sure whether I prefer to wear grappling shorts or gi trousers, but as I wanted to double tonight, that made the decision for me: makes for quicker change of clothes before training the second class if you’ve already got the bottom half on. There was somebody taking an intro class I couldn’t recognise at first because I wasn’t wearing my glasses, but turned out it we’d met before, at the second Birmingham Throwdown. She’s thinking of joining up at RGA, which would be cool (as I frequently mention in this blog, I much prefer training with women, due to their size normally being close to mine, mature attitude and controlled approach to sparring), although as she mentioned she’s soon to go off to Thailand for a few months, I’m guessing that’s going to be delayed. Tonight was heavily focused on the guillotine, with lots of variations. In fact, Jude was unusually varied in technical instruction, as normally we’ll just cover one or two, three at most: I think we went through at least five this time round. First was the basic guillotine from guard, which for no-gi, you grab the head, pull it down, then bring the other arm around the neck. Bring your legs up on their back to lock their upper body down. Grab your wrist, pulling the forearm into their neck. Finally, twist towards your knee, as if you were trying to touch it with your elbow. If they happen to go for a single leg takedown but leave their neck exposed, you can again go for a guillotine variation. Get the guillotine grip on their neck (so one hand under, then grabbing your wrist to secure your forearm into their neck. I presume the one I’m more familiar with, where you grab your bicep and wrap them up, would work too. Or perhaps that’s not so effective in no-gi?). Fall back, bringing one instep into their hip (your knee of that leg therefore should be on the same side as their head, so your have to work it under their body). You other leg should come over the top, locking them into place. Then squeeze and twist your body as before. Should they attempt to escape that by pressing their weight down and walking round, you can try to catch them in a brabo choke. I got a bit confused on this one, so will need to double check: IIRC, from the guillotine position above, push on their elbow and bring your hand right through. Grab your bicep, using your free hand to hold their side, then squeeze. I found it impossible to work my hand through, however, and tended to end up moving my partner over me and onto their back before I could secure it, which wasn’t the idea. I then got to see another choke which was entirely new to me. Still from the single leg defence, cup their chin with your hand. Bring your other hand on top, and pull their head to the centre of your body. Press your chest into the back of their head, then sit-up, digging the edge of your hands into their neck. Combined with your chest, this should end up choking them. Will still work if they stand up, as you can simply follow them up and continue the squeeze. Jude moved on to again work from defending the single leg, this time ending with a brabo choke variation. When they go for the single, sprawl back. Knock their elbow towards their other arm with your elbow, then with the same arm, reach up past their armpit. Spin to your back, then with that arm reach for your other bicep, getting into position for a brabo. You then roll them over your body, which should end up tightening the choke with their own body weight. Again, I had trouble with this, and kept either knocking the wrong elbow, trying to grab my bicep too soon, not spinning to my back properly, ending up with my head on the wrong side, etc. I think I’ve been shown this before, back when Chris was still my regular no-gi training partner, so will have a look back through the blog to see if that sheds any light. Technique over, it was time for sparring. My first partner was Jude, which is always great as he is (as you’d expect) very controlled, and offers lots of tips. He walked me through a guillotine, reminding me to walk my legs up a bit higher: apparently, in my closed guard I’ve been holding it too low. I also found myself frequently going to my back and trying to move into guard, which is something I’m a little too ready to do, as Oli mentioned last time we rolled. That tendency to want to go to my back often leads to people mounting or getting side control on me, especially in nogi where I haven’t got any handles to cling to. Connor would do exactly that in my next spar. After fiddling about with open guard, failing to isolate a leg, get a foot into a knee and secure an ankle with my hand (I managed them separately, but not all at once, which led to a sloppy open guard on my part as they had a leg free), I soon found myself under Connor’s side control. That’s pretty much where I stayed, until Connor eventually worked his way to an arm triangle. I’m still not swimming my arm under and going to my knees, a side control escape I absolutely have to stop neglecting. I keep finding myself going for that same move to half-guard by trapping a leg, then getting kinda stuck when it doesn’t work. Must shift between several escapes instead of getting preoccupied with one. Finally, I had a spar with Tran. He dropped to his back, meaning I had to try and go for the top position. As my top game is non-existent, that soon led to a reversal, though I managed to salvage half-guard (I think). Not that it meant anything: while normally I feel I at least have some space in half-guard, against Tran there was no room at all. He steadily progressed to mount, sucking up any space. His mount was completely solid, so it felt rather like fighting a cliff face as he inexorably moved to high mount. I kept bucking and trying to keep my arms in, eventually attempting to pop out the back by twisting to the side near his legs, but to no avail. I shoved an arm out at some point (my body now crammed up against Tran’s knees), falling straight into Tran’s armbar. Still, was good to have such an unshakeable mount to work against, as after all, I want to work my escapes. Nothing like solid resistance to sharpen up your technique, even if its only small improvements. Unusually, Jude took the no-gi class today: that could be the start of a new trend, as I think I heard him say something about taking over a lot of Felipe’s classes for a while, because Felipe is doing an Open University degree (always good to see people getting back into education :D). Unlike yesterday, there was lots of technique to go through. Jude started off with the single leg takedown we did a while back in a beginners class, also showing a variation if they resist. As you go for the single leg and they maintain their balance, shift your grip and stand up, so that you’ve got both arms underneath their leg. Then change the near hand (so the one further from their foot) to go round their waist, and finally sweep their lone leg with your same side foot, dropping them straight to the ground. He then moved on to the guillotine from guard. Your hand dives around their head, palm up, with the forearm right into their neck, aiming to grab your own stomach or far side. Then use your other hand to grip round the wrist, making a tight hold, finally twisting your torso towards the knee on the same side as your first gripping arm. The choke comes from this swivelling motion rather than squeezing madly on their neck. Another option is to do a guillotine from open guard. This time, one leg comes in underneath and against their stomach (a bit like the scissor sweep), while the other goes around their back. Using the same guillotine grip as before, twist towards the bottom leg for the sub. Jude showed it from your opponent attempting to escape side control by coming to their knees, whereupon you get under their neck, adjust for the guillotine grip, shoving your hips forward and then dropping back into the open guard. Finally on the technical side, Jude showed us some escapes from the guillotine, noting that to free yourself from that particular submission can be both difficult and painful. The first option was if you hand an arm free: get that across their neck. Then bring up the same knee to whichever side your head is on, sprawling back with your legs and driving with your shoulder to put maximum pressure on their chest. Reach back to remove their arm, which should loosen as you drop your weight on them. If your arm isn’t free, reach around their back instead. Push your head to the floor and drive forward, again thrusting your shoulder into their chest. This should also serve to loosen their grip until you can extricate yourself from the guillotine. Like yesterday, I again found myself doing a lot of sparring. I started off with my drilling partner, Leo, who’s roughly my size, if rather stronger. He went pretty light, so I tried playing with guard and seeing if I could get any sweeps. While I could occasionally work my legs into position for an elevator, I couldn’t work out how to bring Leo forward: not having the usual grips made my sweeps even crapper than usual. I probably should have had a try at the sit-up, although I can’t remember if Leo sat back at any point. I haven’t sparred Ben for a while, so had a roll with him after Leo. As always happens when I spar Ben, I found myself at the receiving end of armbars: I almost thought I might be able to bend my arm round the knee and escape, but Ben got my arm back too quick. He also put me in a triangle which I again felt I might have been able to get out of, as I had both arms in, but was squished into my own forearm. There was no chance I’d be able to resist the power of both Ben’s legs and his arms pulling my head down, so soon tapped. I also found it tough under Ben’s side control, where I couldn’t make any space, and in addition failed to get my far leg over to try for half guard. That heel drag step over thing didn’t work under mount either: still, I’d like to work that technique more, as after all I’ve currently just been going off something I saw Johannes do at Belfast. Yet another thing I could ask an instructor next time I get the chance. Next up was Christina, under whom I spent some time squished in side control, and also in her guard. I tried the elbows to hips tip she mentioned yesterday to avoid armbars, which seemed to help. I had no clue how to pass, as again, my passes are poor with a gi, so became even more useless without the grips. I tried to curl into a ball to maintain open guard, and also see if I could trap a leg to pass, but without much success. I need to shrimp more and perhaps keep my knees tighter when they’re trying to pass and give me enough space, as that could then lead to recovering my guard. I was ready to sit out at this point, but Jude dragged me up to spar. The opportunity to roll with a black belt was a nice way to celebrate my hundredth lesson, and as you’d expect, Jude took it very easy and coached me through some escapes and submissions (like the kimura from guard). This again emphasised that I absolutely must shrimp more, with one of the few proactive things I did being that step over to half guard. As soon as I get that, I need to shrimp towards the trapped leg and then get my other leg into position for recovering guard. Under Jude’s side control I felt pretty helpless, even though he was going light: I tried to bridge and make some space, but clearly I’ve got lots of work to do on effective bridging. In general I continue to move too slowly after bridging – I need to use that moment of imbalance on their part to shrimp. At the moment, I’m just sliding up, which isn’t helping to prepare my escape. Annoyingly, I couldn’t find my gumshield before the session, so hopefully I haven’t lost that: will have to check at home. 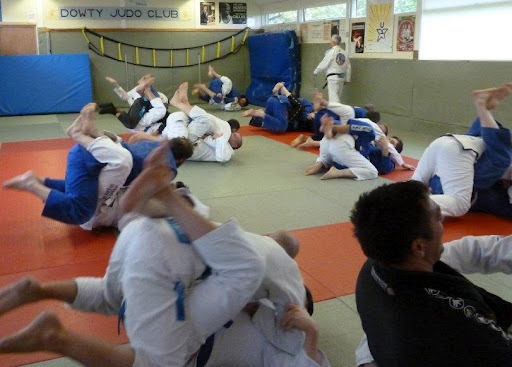 Final piece of news is that there is an academy Open Day on November 17th from 13:00-15:00, which is meant to be a chance for us to all bring down our family and friends to try out BJJ. My gf is away that day, so technically I could try and get some people down, but that depends firstly on if anyone would be up for it and secondly how far I’ve got with my updated writing (for which I’ll be having a meeting on the 20th, so possible that they’ll ask for it before the 17th anyway). That Compeed plaster fell off at some point during the training, but not sure exactly when. So, would appear it can only handle one and a bit training sessions, unless it fell off right at the end. Four more of them to go, which I can but hope will be enough for the burn mark to heal up.